Now that you are entering the final year of your studies, the next buzz word that you hear around the canteen or in the classroom is ‘ campus interview ’. This craze that has descended upon your friends and classmates do make the shivers in you. But just think it this way, getting a job through campus recruitment is surely going to bring self-confidence and it is a matter of pride. Moreover, campus recruitments involve competition from your peers only where getting into a job is fairly likely. But in case you need to go on your own, you have stiff competition from other experienced personnel along with your peers pushing your process of selection to an unpredictable state. Most of the time it could be your friend’s enthusiasm or your family that pushes you to ponder what is your main requirement. You are not sure or unclear on what do you want to do hereafter. But you must understand that this could be your first job that you have landed and it could pave the way for entering into a rewarding career. You need to be aware that each year the selection process gets a bit tighter than previous year. So what you need to do is preparing for an interview well ahead and ensure that you are able to get through. 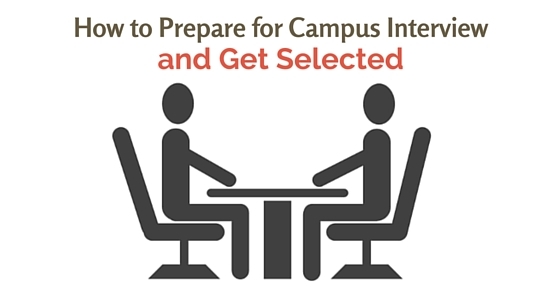 The following mentioned are few interview tips on How to prepare for a campus interview. Every student aspiring to get through the interview process do not focus on the necessary aspects of their resume. For this, you could review some 10 or 15 resume templates that are available on websites. It is better to adopt the layout and way it is presented as your template. Then create a rough sketch of your educational background, your skills, internships you have undergone, workshops attended, projects completed and your hobbies. Highlighting extra-curricular activities that you excelled in gives an advantage over others. While preparing the resume, keep in mind the basic point to avoid clutter and too many jargon words. Use simple language, appropriate font and single colour. Choose and edit words that brings out your contribution and strength. You must be aware by now that job market requires people with good writing and speaking skills in English language. Very few students concentrate on enhancing this skill without knowing that many rejections are due to improper expression. It is better to sharpen your skill from now itself by registering for online English classes. Even reading English newspapers, magazines, web articles everyday will help to strengthen vocabulary. Besides this, do focus on grammatical uses of the language as it is very critical part of communication It helps you to attend part of aptitude test and also during personal interview session. Many students fear the ‘Aptitude tests’ that is the first part of the selection process – written examination. Though some companies do not conduct them, there are a few that believes in this system. Aptitude tests generally focus on numerical problems and logical ability. Don’t wait for the last moment as it is not possible to master within 1 or 2 week. Maybe a 3 to 5 months of practise allows one to understand well and solve the questions easily. As said “Practice makes a man perfect”, your practice helps to enhance speed in answering them. Be it Engineering or IT, definitely you are to face interview questions on subject of education. The interview process would contain subjects that you had studied 2 -3 years back. Don’t let your efforts go waste. Revise the portions that is most important for the practical point of view. Get to know which subjects are generally covered or focussed through your networks or friends who have attended interviews or have got through them. Also be aware that their intention is to know how far you are through with the subject and its application in real world. Concentrate on the core subject so that you are able to answer them for which you need to refer to basic textbooks. You are likely to face this situation during a technical interview which is right after the first phase – written examination. Most of the time the technical questions are posed on basic points and its applications. Wondering what is it? It’s also termed as group discussions. This is to witness the ability of student to explain the facts on his / her beliefs on specific topic that is trending based on economic, technical and political aspects. The following aspects like explanation capabilities, whether they stick to their views, whether they listen and give equal opportunities for others to speak, whether they end with the same note are being observed or assessed. These skills cannot be taught in a closed room but it can be held between 5 -6 member groups allowing for free flow of thoughts on subjects that enhance knowledge and improve oral communication skills. Moreover, it can be enhanced by reading newspapers daily. This is probably the last phase of selection process. Do not lose your chance after crossing all the other hurdles. This aspect can be enhanced by reading about attending interviews on websites and understanding how to perform. There are set of typical questions that are often asked which is also available on websites. Get to know how to answer them. If you need help then proceed to get professional help who would identify your weaknesses. Also you could seek help of some professional services that conduct mock interviews to help out. Practice describing your projects and achievements in less than 3 minutes. Practice speaking slowly so that you are able to explain your ideas clearly. It is especially during personal interviews that sometimes, subjects of controversial matter might be brought out to evaluate your tolerance level. In such cases you need to refrain from using abusive language and bringing out personal view on it. There is also tendency for interviewer to ask awkward question which has to be handled appropriately and intelligently. It’s to test how you react to stressful situation. Most of the time students do want to showcase their talents which is much appreciated. But there are some who pose themselves as if they are well versed in it where reality is different. Then surely one time or other they are likely to be find out. It will eventually embarrass during a critical moment. Hence, being honest about your limitations from the beginning is best and shows that you will not fake later on. This quality is appreciated often. So give it your best in whatever you have and know. These are some skills that need to be learnt by practicing. Maintaining eye contact is one of the main skill. While answering a panel, you could look at all instead of looking only at the one who asked. Learn to avoid harsh reactions towards others views. Learn to greet every time you meet someone as this habituates you. It’s critical to maintain dignity. The last but the most important is your listening skill. Practice the art of listening as you need to respond only after listening to the question carefully. This attitude is to be nurtured from the beginning of your practice session. Don’t allow negative thoughts to overtake your self-confidence. You need to be aware that by maintaining low self-esteem and thinking of the inevitable, it will only push you out of the pathway. By believing in yourself you develop self-confidence. So keep your chin upright and march towards your goal with self-confidence. As there could be many companies that plan to visit, keep a track sheet of the events and companies who intend to visit the campus. Sometimes, a company could cancel their visit at the last moment while there could be some who had scheduled. It’s vital to keep track of the developments as soon as it happens so that you don’t miss out. Besides that, get to know about the company and how it functions through internet. It’s vital to know about its location, main products and services. Update about the company’s major achievements, trends, and future interests. Also, know what jobs are being offered and the job descriptions. Grooming tips are often given out by many on how to present oneself. But the boys need to know that hair needs to be trimmed and they need to be cleanly shaven. Always use formal dress code like white shirt and black trousers. As for girls, their hair should not be left open and they should wear light coloured loose fitting that does not expose too much especially low necked tops and/or short skirts. Always maintain a smiling face. Sometimes the body language too decides your attitude. Sit straight with your hands on your lap. Don’t keep your hands on table and don’t sway your leg back and forth while seated. Look straight in the eye and maintain eye contact while answering. In case there is a panel in front, then look at all the panel members while explaining your point. As selection is based on your resume, it is mandatory to review all the lines you have indicated and know how to answer them appropriately. You must know how to explain your major achievements and projects in matter of two minutes. Most of the campus hiring interviews are classified according to categories – work experience, education, technical skills, problem solving, goals, attitude or behaviour. After all, interviews is about how you are able to sell yourself. In other words your selection depends on how well you are able to communicate your ideas. Your tone, body language conveys a specific message to audience. Refrain using colloquial or insulting words at session. Try to respond with your experience and examples which will indicate your expertise and make a great impression. In fact, every student aspiring to succeed in their career need to follow certain principles from the schools, college and from their home. Also, they need to follow their subjects from day one and along with subject knowledge they need to align it with current trending topics. For this, they need to read newspapers, web, news channels etc. It helps in job interview preparation and to prepare systematically for campus interview and get selected for a job. As said campus interview or college interview are considered as a ticket to your future ride, so plan well, prepare hard for it and face it with a positive attitude. Most of the students do look into the history of campus selection at a specified college. Though it is important to know which companies participate in campus recruitment, it is more important to know How to prepare for it and get through. You must understand that campus interview is an opportunity to grab a job even before graduation.